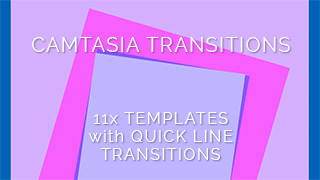 A collection of 11 quick flat line/square styled transitions for Camtasia (PC). Installs directly into the Camtasia library. Drag-and-drop to your timeline. In and outpoints are marked so you can easily position your transitions to the points. Transitions are also very fast, 1-2 seconds long to keep the pace of your presentation. Includes 3x Square transitions and 8 line transitions in different colors to fit your theme. Check out the overview video below. Very colorful items and a nice change from simple “fade to black” etc. Thanks Peter!